If Mayor Bloomberg's wildest decay-related fantasies are realized, New Yorkers will soon be sparing their food scraps from the garbage. A new composting program would encourage (or possibly require) people in the city to collect their food waste in a separate container. Yet Bloomberg may want to consider whether a Manhattan apartment has the square footage to fit both its residents and their potentially harmful compost fungi. The New York City recycling plan, as described in the New York Times this week, would start out on a voluntary basis. Participants would gather their food waste in "containers the size of picnic baskets in their homes," then dump the compost in curbside bins for regular collection. Instead of going into landfills, that waste might be turned into biogas for electricity. Eventually, the program could become mandatory. Vidya De Gannes, a graduate student at the University of the West Indies, St. Augustine campus, in Trinidad and Tobago, has been composting too. She made three kinds of compost, each based on one type of dried plant material (agricultural wastes from the processing of rice, sugar cane, or coffee) mixed with cow or sheep manure. De Gannes and William Hickey, a soil microbiologist at the University of Wisconsin, Madison, who's the senior author of the new study, say these composts are most similar to a homeowner's compost mix of grass and yard waste. To study the biodiversity of species living in compost, De Gannes collected fungal DNA from her compost containers and sequenced it. In total, she found 120 different species of fungus. Each kind of compost had a unique mix of species living inside it. She also turned up 15 fungus species that can cause disease in humans. 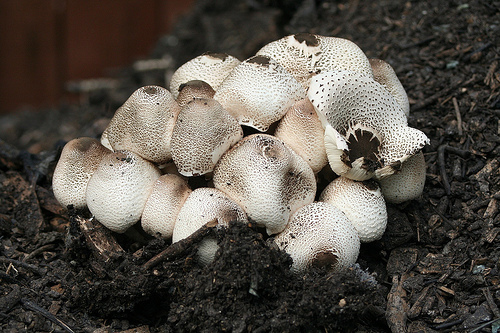 These were present in every kind of compost and ranged from Aspergillus fumigatus, a common fungus that can cause lung infections in people with compromised immune systems, to other species that can infect the skin or eyes. Although the composts De Gannes studied weren't quite what New Yorkers would be collecting in their kitchens—unless they're keeping pet sheep too—some of the potentially dangerous fungi she found have also turned up in studies of all-plant compost. Keeping a compost bucket in an enclosed space is "potentially risky," Hickey and De Gannes wrote in an email. Fungal spores floating on the air can cause infections, especially in people with weakened immune systems. "Compost kept in an enclosed area like a small apartment would probably not have adequate ventilation." To get some fresh air, composters might have to leave their apartments and go around the corner for an extra-extra-large soda. If the program in New York is anything like the one we have in Seattle, people won't actually be doing any composting in their apartments. Any compostable material will be sitting around for a maximum of one week before its carted off to a central facility to actually do the composting. Also, since it's a commercial facility instead of a home compost, you can also include paper towels, napkins and other such paper products in the compost, leading to a much drier (and thus less likely to produce fungus) compost bucket. Though potentially concerning, I'm not sure how much direct applicability the results have for New York's program, even if we ignore the sheep manure. Please note that, other compost studies which were conducted in U.S.A aslo identified fungal pathogens. One such study was that conducted by Bonito et al. 2010 (Identification of fungi associated with municipal compost using DNA-based techniques). I am interested in whether fungal spores collected from the compost were present in any significant levels in the air-- many things support the growth of fungi, and I would like to know whether there is an increased risk of spore inhalation due to the presence of compost in an apartment. Ever smelled a garbage truck up close? Or even a half-block away? That's what composting garbage smells like. You have to bury it or cover with dirt or it smells to high heaven. ESPECIALLY in hot weather. And yes, just like the first commenter said, compostable garbage collected by residents isn't actually composted in their apartments. It is taken away regularly and composted elsewhere, so none of that research is at all applicable. A compostable garbage collection bin in an apartment is exactly as (or less) dangerous than a garbage can in an apartment, and I don't see anyone worrying about those.